On October 2017, a massive data breach was reported by the online forum Lowyat.net. The report claimed that personal data of millions of Malaysians was up for sale online. The data was taken from various sources such as; online recruitment portals, medical associations, as well as over 50 million records of customer data from various telcos. The information reportedly included customer names, billing addresses, mobile numbers, and IC numbers. This incident has set off concerns about the vulnerability of personal data. 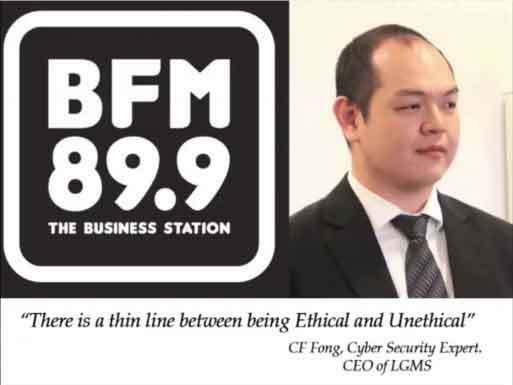 LGMS founder and CEO, CF Fong speaks to BFM regarding the 46 million records massive data leak and web site that was developed to verify personal data leak. There was a massive data breach happening where millions personal data were either leaked or hacked from the major network providers, telecommunication companies or even medical organizations. Some data that had been breached were used to register to telecommunication lines or phone numbers without acknowledgement of the owners of the identification numbers. It has been a norm that people assume the information they always fill in are secured. Sadly, people do not manage their Identity Card (IC) as thoughtfully as how important it is. Later after that incident, a site (sayakenahack.com) was created for consumers whose data may have been breached. This verification website is to assist public in determining whether their personal data was breached. However, it has been blocked by the MCMC and taken down. Cybersecurity specialist warned the public to not use similar online services to check their data. This is due to the concern of multiple copies of the data maybe created if the public uses these online services. The owner of the website who enable the public to check on whether their data was hacked or breached means he has a copy of the data himself. Inserting the information online for checking purposes may lead to another copy of personal data created. It is advised for consumers to directly contact the telecommunication companies to check the numbers that were registered by using their data if they wish to identify whether their data were hacked. Although there was nothing that can be done to the exposed identity card number as it cannot be changed, but it is informed that sim cards for phone numbers cannot be cloned easily. In this case, authorities should also be transparent to provide the consumers explanation to this massive incident.